Following up on a tip on Sunday evening, the Sapulpa Times went to Martin Luther King Blvd., east of Main and found MLK Blvd. blocked off due east of Calvary Baptist Church all the way to the west side of the MLK overpass. There were six Sapulpa Police patrol cars, one OHP unit, and a Creek County Ambulance unit with a patient and crew inside. The Sapulpa Times interviewed the Watch Commander, Captain Deloach, who explained what had happened. Sapulpa PD had been dispatched to MLK Blvd., after receiving calls that a man was walking up and down the steet beating on doors. 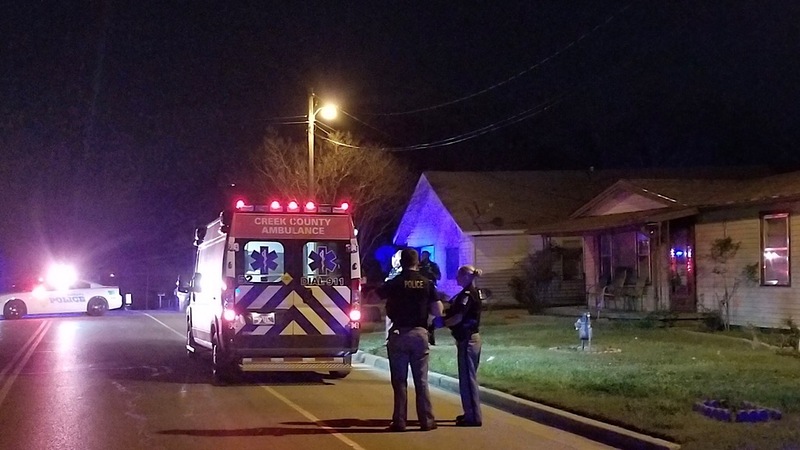 When officers arrived on the scene, they found a white male, approximately 5’10”, 155 pounds, walking in the 300 block of MLK Blvd. carrying a 3-foot-long 2X4. The man was talked into surrendering the piece of wood and complying with officers’ requests. Captain Deloach further stated the man seemed extremely paranoid, was sweating profusely, and exhibited symptoms of being under the influence of an illicit substance, perhaps PCP, coupled with possible mental issues. The suspect, who would not tell officers his name, was taken by ambulance to a local hospital for evaluation.